The Review will soon be up on http://www.planetbollywood.com/ . "Shaurya - Courage to make right... Right" , a movie from the director of "kuch meetha ho jaye", definitely did not raise any expectation from my side when I first saw the promo. And hence It defintely outlives the expectations I carried in the movie hall. 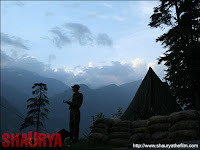 Movie is about " Shaurya", about valor and its interpretation. What is right? Who decides it? How can we classify people? Who draws the line that says you are different than what I am? What should happen to people who stand by and support things that they consider right? Everyone has a view point but how right is someone's right that makes some one else bleed hatred? The story had a premise that takes you through these and many such issues in backdrop of Army affairs. It talks about power and the corruption of character it brings along, It talks of friendship and the space to have opposite views within it, It talks of duties and courage to do what is right. Joydeep Sarkar, Samar Khan and Aparna Malhotra comes up with a story that has a lot to say. But the problem is Movies are a visual medium, you can't easily decode what a person is thinking by looking at his face, you cannot be very obvious in posing the questions that you want to pose through your story. And that is where the writers get the film wrong. Story needs to be backed by an equally strong screenplay, which in my thought was not the strength of this movie. Unfolding of events for the movie are little too slow, little too straight, a little too obviously done. Coming to the Story, it is about Captain Javed Khan's (Deepak Dobriyal) Court Martial Trial for killing a fellow senior of Rajputana Rifles. The Trial is fought by two best friends, who have two different views in the way they take life. 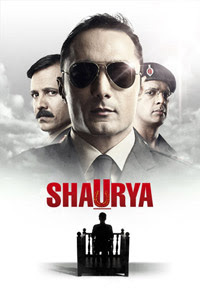 Major Siddhant Choudhary (Rahul Bose) the defense lawyer is very happy-go-lucky person with least interest in fighting the case and Major Akaash Kapoor (Javed Jaafri), a serious army lawyer and the best friend of Siddhant. The trial takes them to the tense and disturbed valleys of LOC and to Srinagar. The story revolves around Siddhant who matures as a person as during the trial he converts himself in to a person who is trying to uncover the truth behind the entire episode. 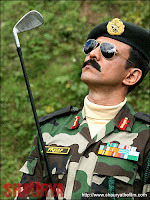 Brigadier Rudra Pratap Singh (Kay Kay Menon) plays nemesis to Siddhant. Pratap is an fearless, arrogant, confident, intimidating army officer, who knows what he is doing and has a judgemental view on the communal issues. He is a Goliath to be fought and our David, Sidhhant takes the challenge. Every confrontation that he has with Pratap, brings humiliation which makes him tough. He fights with himself and his nemesis to unearth the truth, in which he is helped by Kavya (Minisha lamba), a journalist whom he starts falling for, and Kavya's assistant Subhendu. Getting Javed to speak for himself, knowing how he has been for all the past years from his mother (Seema Biswas), knowing how the person he killed was from his wife(Amrita Rao) are all done in a cliched not so inspiring fashion. The movie ends with an emotional outburst from Pratap that gets him caught. First things first, I think the true superlative performance for the movie comes from Kay Kay Menon. He lifts the movie and his character to a different level. His is the best etched character and he plays it with with a great finesse. Even in a rather unbelievable climax, he pulls of the scene with his sheer brilliance. It is one of the finest piece that we have got from the actor. Rahul Bose is good and the role fits him well. You can see that with every passing movie, he is a more mature actor. Javed Jaffri does his role fine which did not have many shades to it. Minisha Lamba, Seema Biswas, Amrita Rao, the ladies who look like unnecessary details of the movie performs their part honestly and if they had not acted their parts well, it would have become sore to our eyes. Deepak Dobriyal, with little dialogues and a small but important role shines. The music (by Adnan Sami) of the movie is just about OK. "Koi Arzoo..." is the only hummable song of the lot. The point of view of writers I guess is very well recited Javed Akhtar's poem by Shahrukh Khan in the Album. It reminds me of another classic from Javed Saab "Mere dushman, Mere Bhai Mere Humsaye...". Javed saab too sounds repetitive in other songs. Cinematography by Carlos Catalan is one of the best part of the movie. He shows the fear of the valley and beauty of it both with great flair. Dialogues are beautiful in parts, especially the ones given to Kay Kay which he acts equally beautifully. And now coming to the culprits for the movie, the first one that I can think of is Editing by Sanjeeb Datta. The movie could have easily been trimmed by half an hour. It gets so slow at times that you just want to get a nap in between. And then lastly and most importantly, all goods and bads of a film goes to its director. Ofcourse, Samar Khan has made a film which is a lot better than his previous one, but he still makes the disastrous mistakes of the movie not being as good as such a topic could have made it. Firstly, The story could have been unfolded with more twists and turns. Secondly, he spends a lot of time, developing each character which is fine in a way and then rushes into an unbelievable climax. A character that is so intelligent and shrewd just lets himself in in the emotional surge. If not Kay Kay Menon, there would have been more bricks Samar Khan's way. Overall, the movie has a message that should be heard and a director who needs to improve. 2.5* is all it gets for falling in to mediocrity of details. Absolutely agree with the fact that the movie goes dead in b/w and could have been cut short. Good analysis of the movie,Jay. Well, you have a holiday next Monday as well. I'll look forward to another nice review.